This article is about the operator of the InterCity West Coast franchise. For the operator of the InterCity East Coast franchise, see Virgin Trains East Coast. For the former operator of the CrossCountry franchise, see Virgin CrossCountry. For corporate information, see Virgin Rail Group. 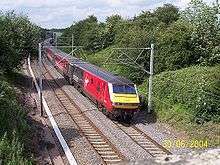 Virgin Trains (legal name West Coast Trains Limited) is a train operating company in the United Kingdom owned by Virgin Rail Group (51%) and Stagecoach (49%) that has operated the InterCity West Coast franchise since 9 March 1997. 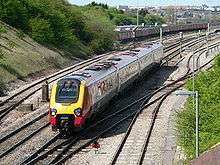 Virgin Trains operates long-distance passenger services on the West Coast Main Line between London, West Midlands, North West England, North Wales and Scotland. The service connects six of the UK's largest cities; London, Birmingham, Manchester, Liverpool, Glasgow and Edinburgh, which have a combined metropolitan population of over 18 million people. 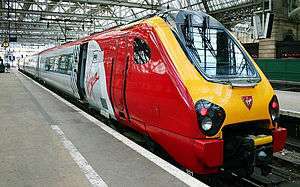 The Virgin Trains brand has also been used on the legally and operationally separate Virgin Trains East Coast since 1 March 2015, and previously on Virgin CrossCountry, which operated between 1997 and 2007. Virgin has around 3,400 employees. In May 1998 Virgin introduced new services from London Euston to Shrewsbury and Blackpool North. The former ceased in 1999, the latter in May 2003. In December 2014, a daily weekday service between London Euston and Blackpool North and a twice daily service between London Euston and Shrewsbury were reintroduced. In September 2005 Virgin introduced its first 125 mph timetable following the completion of Stage 1 of the upgrade. 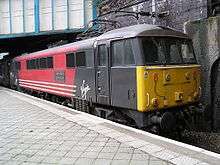 In December 2008 a Wrexham to London Euston service was introduced operating south in the morning with an evening return. From January 2009 Virgin Trains gradually rolled out a new Very High Frequency timetable to take advantage of the completed West Coast Main Line upgrade. There were many timetable changes from 8 December 2013. These resulted in new timetables. Edinburgh/Glasgow services now run to/from London and call at Sandwell & Dudley replacing the hourly Wolverhampton to Euston service. In addition most Liverpool services will additionally call at Crewe. This has resulted in the latter being serviced by four Virgin trains in each direction per hour to/from London instead of the previous two. A London Euston - Glasgow Central or Edinburgh Waverley via Birmingham New Street Milton Keynes Central, Coventry, Birmingham International, Birmingham New Street, Sandwell and Dudley, Wolverhampton, Crewe, Warrington Bank Quay, Wigan North Western, Preston, Lancaster, Oxenholme Lake District (1tp2h), Penrith (1tp2h), Carlisle, then either (Glasgow Central) or (Haymarket, Edinburgh Waverley). Trains call alternately at Watford Junction and Rugby. Certain trains are extended beyond Chester to/from Bangor (Gwynedd) or Holyhead. 1 train on Monday-Friday is extended to/from Wrexham General. 2tph run via Stoke-on-Trent and 1tph runs via Crewe. F London Euston - Glasgow Central Warrington Bank Quay, Wigan North Western, Preston, Lancaster, Oxenholme Lake District (1tp2h), Penrith (1tp2h), Carlisle. Trains call alternately at Oxenholme Lake District and Penrith. and driving cars stored at Central Rivers depot. Following the loss of a Class 390 Pendolino in the Grayrigg derailment, a Mark 3 set with a Driving Van Trailer was leased with a Class 90 hired from English Welsh & Scottish as required. In 2008 Virgin looked at leasing two Class 180 but decided to retain the Mark 3 set. Nicknamed the Pretendolino, this received re-upholstered seating, power points, wi-fi and a full external re-paint at Wabtec, Doncaster in 2009. 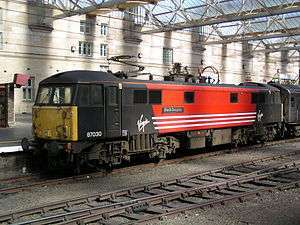 Virgin used this set with a Class 90 locomotive hired from Freightliner on a Euston to Crewe (via Birmingham) service on Fridays only until December 2012. 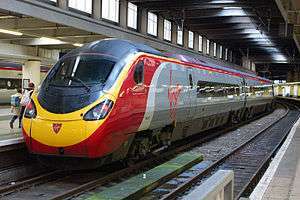 From 9 December 2013 it was utilised to operate a London Euston -Birmingham New Street train on Thursdays and Fridays only, until its withdrawal in October 2014. The Mk.III set was also occasionally hired out as a private charter train. It was used in the filming of Harry Potter and the Deathly Hallows and can be seen at King's Cross station at the end of the film. It is currently in use as a 'hot spare' with Abellio Greater Anglia. Mark 3 Pretendolino Passenger carriage 110 177 1975–1986 2014 Charter Train & Spare Train, was refurbished in 2009, formed of 5 TSO, 1 RFM, 3 FOs & DVT 82126, transferred to Abellio Greater Anglia. In 2016, the franchise was further extended until April 2019. Virgin Trains were Carlisle United F.C. 's travel sponsor for the 2013–14 season, and for the 2014–15 season they are the club's main shirt sponsor agreeing a further two-year deal. On 5 August 2014 Virgin Trains also agreed to be the shirt sponsor of Preston North End F.C. on a two-year deal. Virgin Trains has also sponsored events such as Manchester International Festival in 2013. 1 2 "Virgin Trains West Coast". Office of Rail and Road. Retrieved 15 November 2015. ↑ BBC. "'Glitch' on West Coast main line". BBC. 1 2 "Rail performance results period 13". Network Rail. ↑ "National Rail Trends 2001-2002 Quarter Four" (PDF). Strategic Rail Authority. ↑ "National Rail Trends 2002-2003 Quarter Four" (PDF). Strategic Rail Authority. ↑ "National Rail Trends 2003-2004 Quarter Four" (PDF). Strategic Rail Authority. ↑ "National Rail Trends 2004-2005 Quarter Four" (PDF). Strategic Rail Authority. ↑ "National Rail Trends 2005-2006 Quarter Four" (PDF). Office of Rail Regulation. ↑ "National Rail Trends 2006-2007 Quarter Four" (PDF). Office of Rail Regulation. ↑ "National Rail Trends 2007-2008 Quarter Four" (PDF). Office of Rail Regulation. ↑ "National Rail Trends 2008-2009 Quarter Four" (PDF). Office of Rail Regulation. ↑ "National Rail Trends 2009-2010 Quarter Four" (PDF). Office of Rail Regulation. ↑ "National Rail Trends 2010-2011 Quarter Four" (PDF). Office of Rail Regulation. ↑ "National Rail Trends 2011-2012 Quarter Four". Office of Rail Regulation. 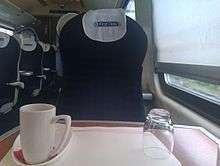 1 2 "Virgin Trains West Coast - Table 2.20". ↑ Thornton, Philip (17 February 1999). "The Player: Chris Green, Chief Executive of Virgin Rail: Right man to tackle 'mission impossible'". The Independent. London. Retrieved 6 June 2009. ↑ Balmforth, John (2007). Virgin Trains: a decade of progress. London: Ian Allan. ISBN 978-0-7110-3224-8. ↑ "Virgin Trains goes Atomic" (Press release). Virgin Trains. 28 February 2006. ↑ "Train crashes in Lake District". BBC News Online. 23 February 2007. Retrieved 23 February 2007. ↑ "Rail crash report blames points". BBC News Online. 26 February 2007. ↑ "Virgin to eliminate four-car Super Voyagers". Rail-News.com. Ashby-da-la-Zouch. 16 November 2010. ↑ "Super Voyager fleet refreshed - early" (Press release). Virgin Trains. 13 February 2009. ↑ "Please note: Virgin Trains onboard entertainment system no longer functions." Headphones, Virgin Trains. ↑ "Virgin Trains customers get on-board WiFi between Birmingham and Scotland" (Press release). Virgin Trains. 5 November 2009. ↑ "Virgin Trains customers get on-board WiFi from North Wales and Chester" (Press release). Virgin Trains. 5 November 2009. ↑ "Wi-Fi on Virgin Trains". Virgin Trains. Retrieved 24 October 2010. ↑ "Virgin Trains honour teen fundraiser Stephen Sutton". Dial2Donate. Retrieved 15 September 2015. ↑ "Charter train potential for Virgin Trains' 'new-look' loco-hauled trainset" (Press release). Virgin Trains. 1 July 2009. ↑ Wright, Robert (20 May 2009). "Branson urges £1bn rail spend". Financial Times. London. Retrieved 25 May 2009. ↑ Ford, Roger (November 2010). "No extension for Virgin". Modern Railways. p. 7. ↑ "Shortlisted Bidders for Greater Anglia and InterCity West Coast Franchises" (PDF) (Press release). Department for Transport. 24 March 2011. ↑ Milmo, Dan (15 May 2011). "Transport minister Philip Hammond delays Virgin Trains' west coast sale". The Observer (London). ↑ "West Coas passengers in line for 28,000 extra seats as franchise extension signed" (Press release). Department for Transport. 27 October 2011. ↑ "InterCity West Coast franchise" (Press release). Department for Transport. 20 January 2012. ↑ "New operator for West Coast passengers" (Press release). Department for Transport. 15 August 2012. ↑ "West Coast Main Line franchise competition cancelled" (Press release). Department for Transport. 3 October 2012. ↑ "Virgin to run West Coast route 'for at least nine months'". BBC News. 15 October 2012. ↑ "Department for Transport to negotiate with Virgin on temporary operation of West Coast rail services" (Press release). Department for Transport. 15 October 2012. ↑ "Virgin Trains to run improved west coast services" (Press release). Department for Transport. 6 December 2012. ↑ Two-year-extension-for-Virgin-Rail-after-West-Coast-chaos.html "Two-year extension for Virgin Rail after West Coast chaos". The Daily Telegraph (London). 6 December 2012. ↑ "Railway plan puts new focus on passengers". Secretary of State for Transport. 26 March 2013. ↑ "Update: Direct London-Shrewsbury rail services" (Press release). Virgin Trains. 15 January 2014. ↑ "Franchise combines WCML services with HS2 in 'seamless integration'". ↑ "Preston North End Agree Virgin Trains Partnership". Preston North End F.C. 5 August 2014. Retrieved 4 March 2015. ↑ "Virgin Trains sponsor Manchester International Festival". 10 June 2013. Retrieved 29 April 2014. ↑ Julian Glover (9 June 2016). "GoMedia extends to Virgin Trains". ↑ Thomas Flanagan (23 June 2016). "Maxdome content jumps onto trains, but on-board WiFi still hopeless". Retrieved 18 August 2016.